Freed from the friendly embrace of the barmaid, we were able to better appreciate interior of the pub. 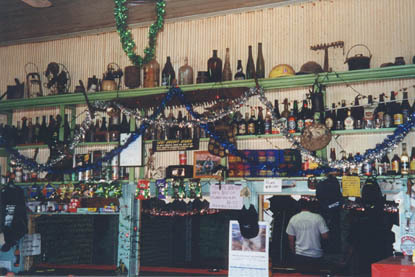 The main bar was remarkable: there was only Swan on tap (both of them), but you were able to order bottled beers. If you did, they were promptly plucked from two giant eskys that also lived behind the bar. 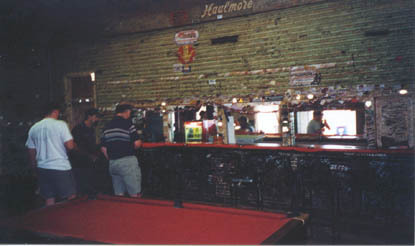 Sitting at the bar were three filthy, rough-as-guts miners. Each with their own personalised stubbie-cooler! Somewhat amazingly, they were all drinking Calton-Midstrength. It appears that the mid-strength craze, so popular in Queensland, has also caught on in Western Australia. But then again, we are better off for it: the public transport isn't so good 100 kilometers from the nearest town of any note. Moving from the main bar, we walked around the side into the back room. It contained a fireplace and two pool tables. 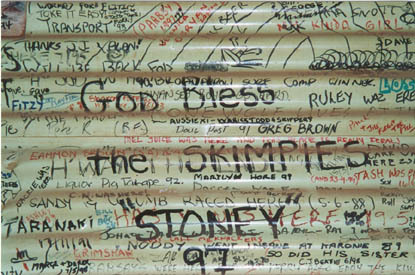 But the real attraction, as with the rest of the pub, was the walls - all chockers, from top to bottom, with scrawled names and the like. Great stuff. 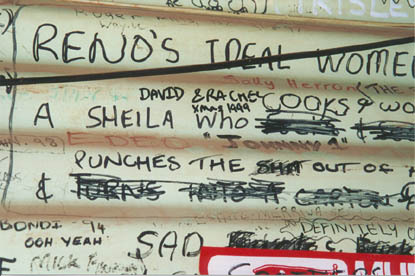 We went for a closer inspection: some of the scrawls were certainly witty (and, some may say, mildly offensive). 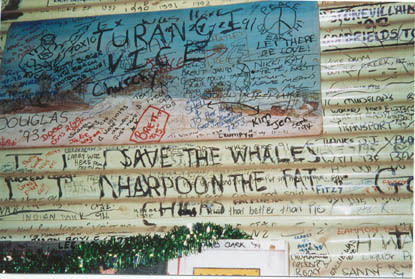 "Save the Whales, Harpoon the Fat Chicks"
We wandered into the side room. In stark contrast to the main area of the pub, it was scrawl free. On closer inspection, it became obvious why - the room was set up as a remembrance shrine for people who had been killed in the mines. Quite sad really, reading laments for old mates. There was also some background material regarding the town itself. An old gold mining town dating back to 1896, its population had peaked in 1901 at 15,000. By 1933 this had been reduced to 130. By 1999 this had been reduced to 10. We were drinking in a pub in a 100 year old mining town of population 10. Many many miles from anywhere. No wonder people seemed, well, a little rough around the edges. So next time you find yourself in the Broken Arrow, in the middle of the WA Outback, then see if you can find our name on the wall (let us know if you do). Our next stop? One of the locals had told us that we were only 100 km from the real heart of the WA Outback - the famous Kalgoorlie. With 'shitloads' of pubs. That's all the direction we needed.